Frank and Marcia Carlucci serve on the RAND President's Council. In 2012, they established an endowed scholarship at the Pardee RAND Graduate School that has since sponsored ten first-year students. They also provide annual grants to promising researchers to give them the freedom to think beyond project work. Former Defense Secretary Frank Carlucci's service to RAND spans more than 30 years. He's been a board member, an advisor, a committed donor to RAND and the Pardee RAND Graduate School—and in his family, that's just the start. His wife, Marcia, helped him establish an endowed scholarship at Pardee RAND and now serves with him on the RAND President's Council. His daughter, Kristin, spent several years as a researcher at RAND and RAND Europe, specializing in international security and defense. She also met her husband at RAND; Joshua Weed was just out of the Air Force Academy and earning his Ph.D. in public policy at Pardee RAND. Carlucci joined RAND's Board of Trustees in 1983 with a White House pedigree and a keen interest in public policy. His career in government had taken him from the Office of Economic Opportunity to the Office of Management and Budget to the ambassador's house in Portugal. He had served as under secretary of Health, Education, and Welfare; and as deputy director of the CIA and the Defense Department. He stepped down from RAND's board in 1987 after President Reagan appointed him secretary of defense. He served for two years and became known for a wideranging effort to rein in costs and streamline procurement in the Department of Defense. He rejoined RAND's board in 1989 and served almost without break until 2007, when he became a trustee emeritus. He also worked during that time as the chairman of the Carlyle Group investment firm. His daughter, Kristin, grew up with the same interest in public policy and earned a master's degree in international relations from Johns Hopkins. At RAND and RAND Europe, she worked on topics ranging from drug abuse to terrorism to rethinking the educational system of Qatar. Her future husband, Joshua, was working on a dissertation at Pardee RAND that would help the Air Force improve its housing procurement. Frank and Marcia Carlucci now serve together on the RAND President's Council, a small group of top donors that provides philanthropic support and advice. They also provide annual grants, the Carlucci Investigator Awards, to promising researchers to give them the freedom to think beyond project work. Their total gifts exceed $2 million. In recent years, they have focused their support especially on Pardee RAND and its students. They endowed an annual scholarship in 2012 that has since sponsored ten first-year students, allowing them to pursue their Ph.D.'s in public policy. 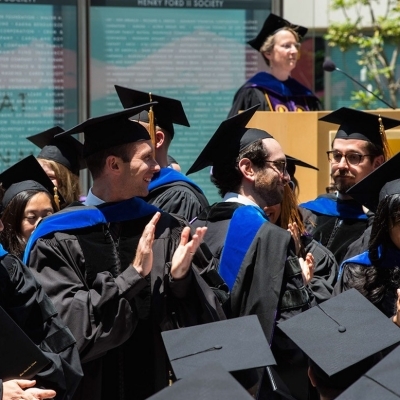 As an integral part of RAND, the Pardee RAND Graduate School is educating policy leaders who will confront emerging social issues and anticipate tomorrow’s questions and policy concerns.